My objective is to work with you to design and develop an effective, goal-reaching website. My web design process starts with understanding the project and audience. This step is very important to discover how to present your website in a user-friendly way. The objective is to create a delightful, informative, and action triggering experience for your website visitor. 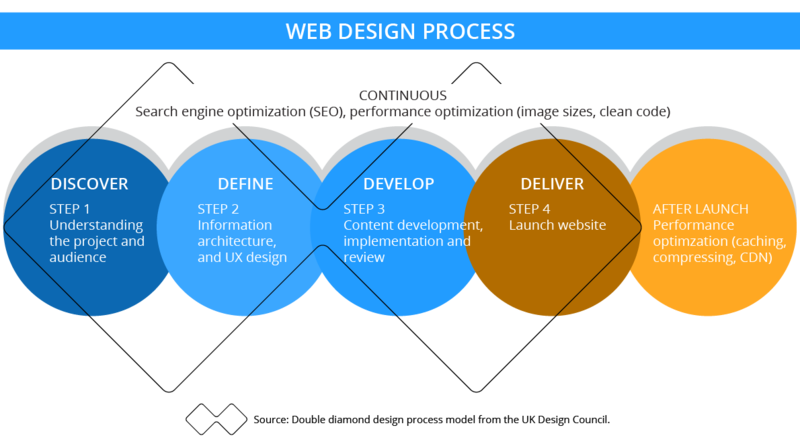 The second step in the web design process includes information architecture, and UX design. This means that I will work with you to create an outline of your site that defines the navigation and page structure. Thinking through your website content and hierarchy at this point will make a blueprint for design and development. Looking at your Google Analytics will give you data on what pages are visited the most and how your website visitors are navigating there. Maybe you don't need 6 or more top navigation links...maybe only 3 are needed. The next step is to add your content and review. You may want to work with a copywriter to optimize your copy for the web. Headlines and breaking up your copy is more important than in print. The Yoast SEO plugin is also a great tool to improve your writing. The final step in the web design process is migrating your website from a staging environment to your live URL, where performance optimization tasks are implemented. The web design process will scale with the size of your website and budget. My objective is to work with you to design and develop an effective, goal-reaching website. The web design process will scale with the size of your website and budget. My objective is to work with you to design and develop an effective, goal-reaching website. To summarize, the design and development of your website project includes the following and I will work with you to implement the most cost-effective option specific for your website. WordPress is a the largest content management system (CMS) on the globe and powers over 25% of all websites. It is free to use and you can have any type of website on it -- from eCommerce and membership sites, to business sites and blogs. In addition, there are thousands of plugins available to extend the functionality of your website to include eCommerce, social media, forms, membership tiers, SEO, and much more. I also work with the Bootstrap and Foundation frameworks. These frameworks are often used for large-scale website. I work on customizing CSS, page layout, and designing modules. Banner ads, infographics, icons, and wireframes are samples of some of the web design support I provide as a consultant or on a contract basis. My clients come from many different industries. I design websites for engineering and repair facilities, community theater, schools, tech companies, public relations firms, painters, sports blogs, political candidates and non-profit organizations. Please visit my portfolio to see recent projects. I've also written about securing websites with HTTPS, and adding reCAPTCHA to your forms. In addition to web design and development services, I offer website optimization, art direction and print design and presentation design services.